NaturVet Arthrisoothe Gold Level 3 Soft Chews - 180 ct.
Home > Misc > See All Products > NaturVet Arthrisoothe Gold Level 3 Soft Chews - 180 ct.
NaturVet Arthrisoothe Gold Soft Chews is a glucosamine supplement for dogs and cats. 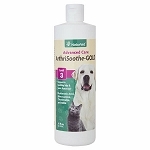 With glucosamine, chondroitin, MSM to help reduce joint pain in pets. 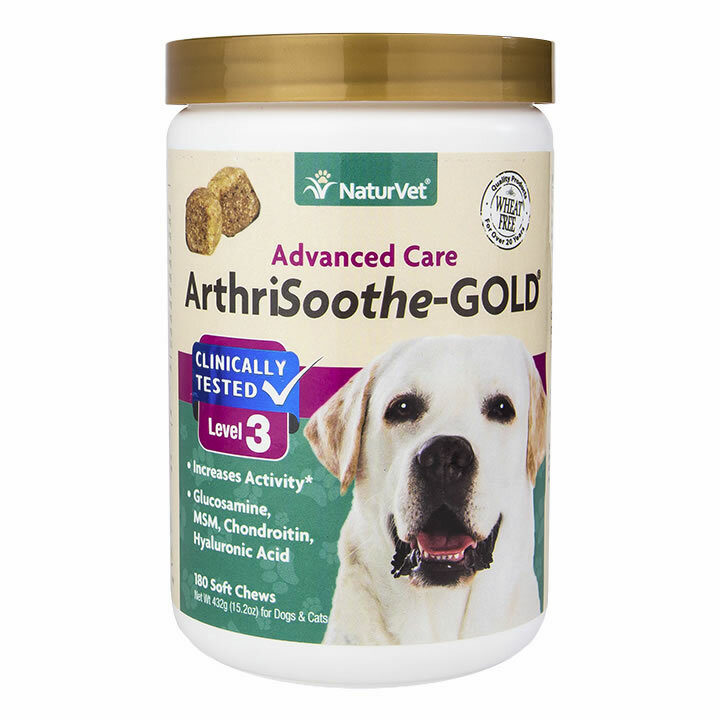 Arthrisoothe Gold is a glucosamine supplement that helps dogs and cats with joint pain and stiffness. 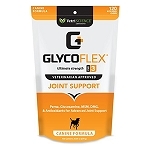 This formula contains extra strength levels of glucosamine, chondroitin, MSM and more for pets with advanced joint dysfunction. The antioxidants Vitamin C and Vitamin E help protect against free radicals that cause cellular damage. Recommended to support healthy hip and joint function in pets. Available Size: 180 ct. soft chews. Also see tablets and liquid. This product is one that I have bought for a couple of years. When I opened the new jar, the nuggets were different in shape, texture and odor. Our dog still takes them, but I was a little concerned about giving them to her. This was recommended by a Holistic Chiropractor for animals. I thought I'd try it as our Golden has been on something else for a long time and it was time to change. These gave him more energy than we have seen in a long time. Still a little stiff in the hips but it has only been one month that he has been taking them. Enzyme Blend - 130 mg.
Brewer’s Yeast, Canola Oil, Dried Potato Product, Flaxseed, Glycerin, Lecithin, Maltodextrins, Mixed Tocopherols, Natural Flavoring, Rosemary Extract, Sorbic Acid, Tapioca Starch, Vegetable Oil and Water.